Somehow I managed to earn my college degree at U-M without ever eating at Mr. Spots. A favorite to many college students for many years, Mr. 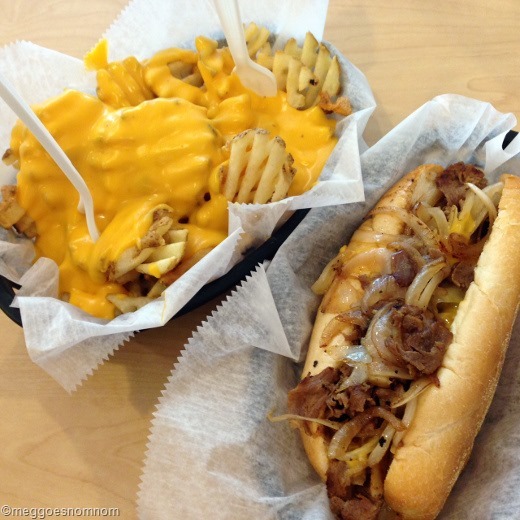 Spots is best known for their chicken wings, waffle fries, and Philadelphia-style hoagies and steak sandwiches. I’ve also lived in Ann Arbor for ten years without really every properly “doing” the Ann Arbor Art Fair. Sure I’d passed by it on foot or detoured around it in my car for years (ack! ), but never really checked it out properly. This year, I decided to remedy that. Anticipating crowds of people flocking to Ann Arbor for the event (and thus, anticipating crowded restaurants in the Art Fair vicinity on Friday night), we sought out a place where we could grab a casual dinner without a wait, and Mr. Spots fit the bill, as our parking and Art Fair perusals brought us near the State and Hill intersection. 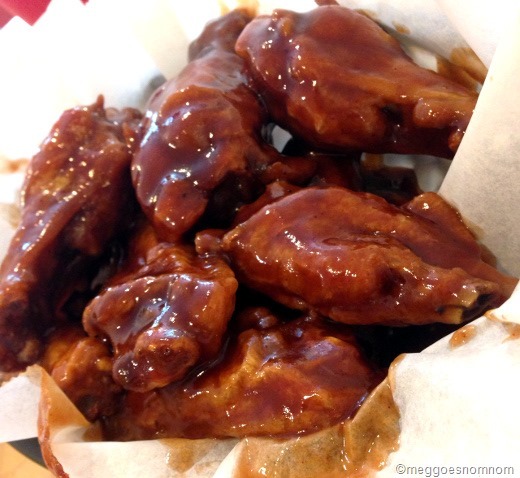 I like wings, but I don’t go gaga for them like the huz. The Philly Original seemed more my style. 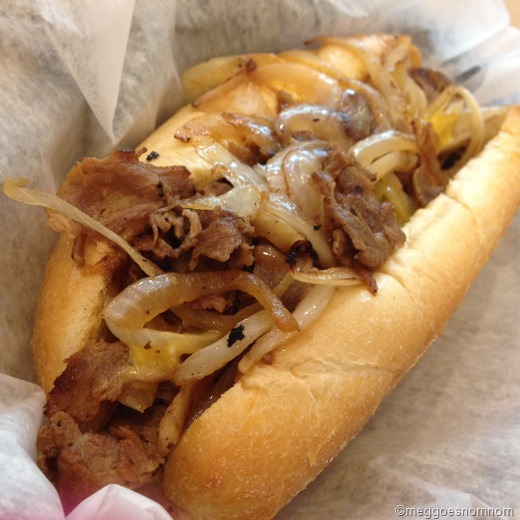 All of Mr. Spots’ steak sandwiches are made with USDA choice ribeye steak and served on amoroso buns. The steak is super thinly sliced, tender, and flavorful. My six-inch Philly Original was served with American Cheese and sweet and savory tender grilled onions. Fantastic! 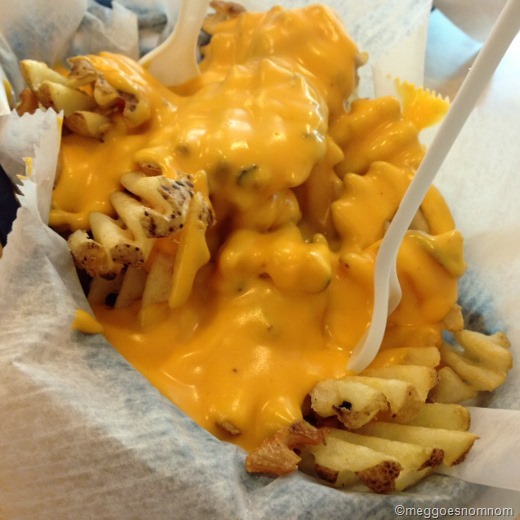 And we had to try the Cheese Fries. Holy heart attack, can you say drunk food? Wowie! We easily split an order of these bad boys. All I have to say is that these were intense. Obviously there is no way these could be bad. I liked how well the large waffle fries stood up to the thick layer of (neon) cheese sauce, without becoming too soggy. Yum. I definitely was not counting calories for this meal. And it totally hit the spot! Mr. Spots offers a thriving delivery service as well, but I am not sure if I would want to order delivery because the best part of this food was how hot and fresh it was when we dined in! My sandwich was still emitting steam as it was seated in front of me! And the bun was a perfectly warm and toasty. Mmm. Mr. Spots offers three or four huge booths and a handful of smaller tables for dining in, as well as take-out and delivery. I’m a fan! I never made it to Mr. Spots either, but sandwiches have never been an especial favorite of mine (unless it’s Zingerman’s, because Zingerman’s). Art Fair, on the other hand, was mandatory for the retail sales alone. But, having lived and worked downtown, I maintain that it’s not art and it’s not fair.